Starting with my pick of the week, Quentin Tarantino's controversial Django Unchained. It's a movie which has been described as Tarantino's take on a 'Southern' - something with most of the attributes of a Western, but set in the Deep South during the middle of the 19th century, before the abolition of slavery. Our guides into this often disturbing world are an enlightened German bounty hunter, Dr King Schultz and the slave who he frees and takes on as his apprentice, Django Freeman (Jamie Foxx). 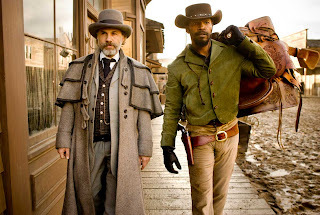 The pair spend the first two thirds of the film travelling through the southern states, killing fugitives for reward money, before we reach their ultimate destination: Candyland, the estate which is home to sadistic, twisted plantation owner Calvin Candie (Leonardo di Caprio), and the current location of Django's wife... While Django isn't perfect - for me, it's closer in quality to a flawed picture like Inglourious Basterds than a masterpiece like Pulp Fiction - there is plenty to enjoy here. As is usual with Tarantino movies, there are some brilliant comic set pieces - particularly the scene in which a group of KKK members bicker about the eyeholes on their masks being askew - some rousing, violent action scenes, and various nods and winks to the sometimes disreputable movies of the past which have inspired the director. I was also highly impressed with the performances of Waltz, Foxx, Samuel L Jackson (as the cruel head slave) and particularly Di Caprio, who makes for a supremely repellent villain. My main complaint with this one would be in the way in which it ends - without giving two much away, the movie builds to a strirring climax with its first ending, but then continues for a further half an hour, which allows Django to get his revenge on pretty much everyone who ever wronged him, one at a time. This final section felt rather indulgent to me - especially as it includes a typically cringeworthy cameo from QT himself, speaking in one of the least convincing Australian accents of all time. Nevertheless, the movie, on the whole delivers - for your money, you get a great (if rather gruesome) night at the cinema. 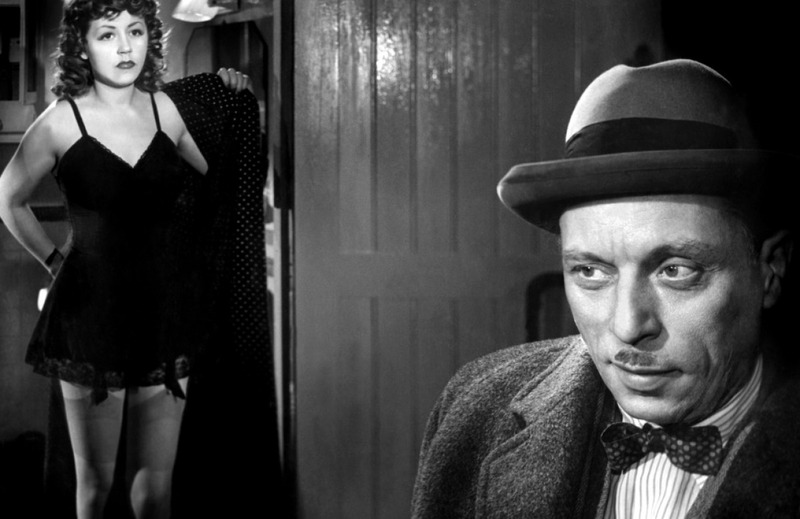 A strong runner up was Quai des Orfevres, a classic French crime drama from the 1940s. It was directed by HG Clouzot, who was also responsible for the brilliant suspense thriller Les Diaboliques, a movie which ranked at number 3 on my "Top Ten French Movies" list. Quai des Orfervres is a strange film in some ways - the story which centres on the murder of a prominent (but lecherous) industrialist - but there seems no great mystery to what has has happened, as we spend much of the first half of the movie with the apparent culprits - a beautiful young singer and her jealous older husband. Having set the scene, the great detective Antoine enters the story. He's a fascinating character - shabbily dressed, accustomed to being treated in a disdainful manner by criminals, witnesses and victims alike, but he has an incredibly sharp mind and is soon able to expose the flimsy lies with which the singer and her husband attempt to conceal their involvement in the case. However, the film isn't just an interesting murder mystery - it's also a highly vivid portrayal of two highly different worlds - the theatre and the halls of justice - co-existing at the same time, and only a few miles apart. Highly recommended. Finally, my award for 'turkey of the week' will have to go to the shlocky anthology horror film Creepshow, which presents five different stories, taken from the pages of a horror comic book. On the face of it, the movie sounds like a can't miss proposition. It's scripted by Stephen King (an author I've really come to appreciate recently) and helmed by George A Romero, legendary director of Dawn of the Dead, Night of the Living Dead, Martin and a few other horror classics. Sadly, the various segments of the picture vary wildly in quality. The first section is undoubtably the worst - a group of highly unpleasant rich people are menaced by the unconvincing looking corpse of their dead father. By far the most bizarre and terrifying aspect of this section is Ed Harris cutting a few shapes on the dancefloor. Truly disturbing stuff. 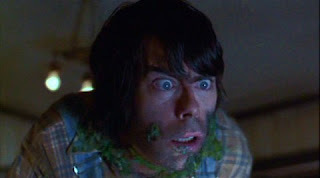 Following that, we get to see Stephen King trying his hand at acting (badly, but probably better than Quentin Tarantino) as a country bumpkin who encounters some strange, parasitic vegetation which arises from an asteroid. There's also a moderately entertaining bit with Leslie Nielsen hamming it up as a man who wreaks unspeakable revenge on a man (Ted Danson!) who has been sleeping with his wife, and finally, the best section of the lot, in which a reclusive biollionaire finds his hermetically sealed penthouse apartment under attack by an army of cockroaches. Aside from the first segment, which is dreadful, and the final segment, which is actually pretty creepy, the rest of the movie is just mildly diverting. I wasn't particularly impressed with the quality of the special effects (sometimes laughably unscary) or by the quality of the script - I suspect that it was written in the middle of Stephen King's 'out of control addict' phase. Not one I'm likely to return to in the future. "Ed: You didn't tell me Barbara had a Jag. I've always wanted to drive one of those. Shaun: Yeah, well, it's Philip's, okay? He won't let anybody near it. Honestly, I put half a Mars bar in the glove box once and he chased me around the garden with a bit of wood." I think the odd ending to Django Unchained was deliberate. Tarantino loves self-indulgence and sheer, pleasurable entertainment, so I think he was enjoying drawing out the story a little bit more and felt others would too. Also, I think Tarantino prefers a bit of an anti-climax: Pulp Fiction's ending is excellent, but quite simple and inactive, so to speak, especially when compared to earlier scenes.